Este nuevo V Raid Kaliber Tierras de Al-Andalus, ha cambiado de nombre, a partir de ahora pasa a llamarse RAID KALIBER-ANDALUCIA. Esperamos que con el cambio de denominacinn, se aun mas grande y fabuloso Raid, que recorre Andalucia de parte a parte, descubriendo todos sus bellos paisajes, que este ano, estaran tapizado de un verde especial y de algunos mantos de agua, que es vida para el campo. 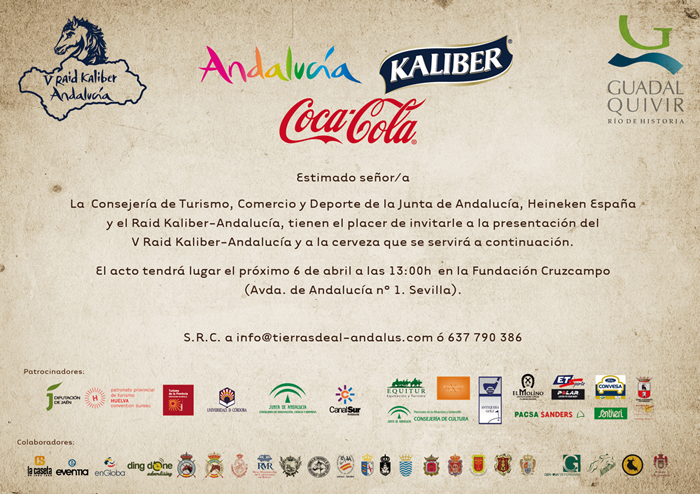 This new V Kaliber Land Raid Al-Andalus, has changed its name, from now renamed KALIBER RAID-ANDALUCIA. We hope that with the change of name, is even bigger and fabulous Raid, which crosses Andalucia from side to side, discovering all its beautiful landscapes, which this year will be a special green trim and a few coats of water, which is life for the field. SOME of the best endurance riders in the South West were at the Wellbeck Equestrian Centre, Exeter, last weekend, to pass on the secrets of their success. Endurance riders competing internationally in ERs and FEI events ride distances of up to 160km (100 miles) in a day. This demands a very high level of fitness for both horse and rider and is a quite different experience from the graded rides up to 80km (50 miles) that the most endurance riders take part in. Among the senior and elite endurance riders there was Kay Palme, from Launceston, who demonstrated dressage for the endurance horse, Shepton Mallet's Christine Yeoman, who talked on achieving horse fitness for the longer rides, and Nicky Sherry, from St Breward, who explained the different rules of ERs and crewing essentials for success. Annie Joppe, of Goonhavern, and Karen Jones, of Culmstock, who are both South West members of the Endurance GB Elite Squad of riders, had brought their horses, Fantom and Macademia, to demonstrate crewing techniques. They also explained their own personal methods of getting fit enough to ride 160km in a day - as demanding as any other athletic discipline. A COLD start and chill wind welcomed the many horses and riders who took part in the latest Escrick Park Pleasure Ride. However, it remained dry until the last of the riders arrived safely back at the venue, which was in stark contrast to the heavy snow showers that plagued this event last year. Organised by the North and East Yorkshire Group of Endurance GB, the ride gets the season off to a great start, passing through some scenic countryside around Escrick Park and Skipwith Common. All of the group’s pleasure rides are suitable for beginners and families, as well as the more experienced rider, and many were enjoying their first taste of endurance riding. There were two routes available, a shorter ride covering 20k or a longer route covering 30k. For anyone who would like to find out more about endurance riding, there will be a training day at Knayton, near Thirsk, on April 17. The training day will cover everything from map reading and horse fitness, to rules and completing forms. E NDURANCE is a tough sport, and definitely not for the faint hearted, so the South West can be proud of the fact that two of its riders have made it onto the Endurance GB British Team Elite Squad. Annie Joppe with her horse, Dilmun, from Perranporth, Cornwall, and Karen Jones with Macadamia from Culmstock, Devon, are now working hard to be selected for this year's World Equestrian Games in Kentucky. The EGB British Team Elite Squad is a small pool of horses and riders selected from the Endurance GB Senior Squad. It is from the Elite Squad that a team of up to five combinations will be chosen to represent Great Britain. To become part of the elite squad takes total commitment, dedication and hard work on the part of each rider as they must attend various training and assessment weekends held around the country. At these sessions both horses and riders undergo rigorous evaluation by a team of veterinary experts comprising vet, equine physiotherapist, farrier, trainer and human physiotherapists. Interestingly, the team vet, Hugh L Salmon, BVetMed DBR MRCVS, is also from Devon and is based at the Wolfgar Veterinary Surgery in Cheriton Bishop. Horses are assessed by trotting up and lunging on a hard surface before being checked in more detail. The horses are then assessed while being ridden. Riders must do a dressage test to illustrate the level of schooling and suppleness of the horse, which is assessed by team trainer, Annabel Schofield. 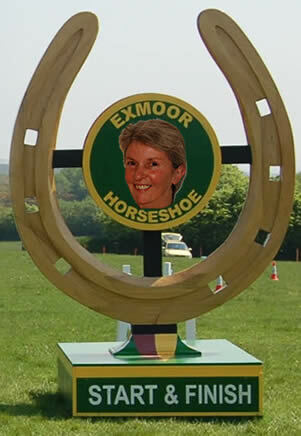 They call her, Mrs Golden Horseshoe. They also say you need lots of endurance to keep up with her. For Barbara Wigley, a busy, fast-talking, no-nonsense, endurance rider is the driving force behind what over the years has become one of the great, legendary endurance rides in the world. Not that there haven't been set-backs along the way. In fact, at one time it looked as though the days of the Golden Horseshoe, which today covers 100 miles of the toughest terrain in the country, were very nearly over. Barbara was born in Stretford, Manchester. Her family were distinctly non-horsey. Her father was a painter and decorator. Eventually, he opened a painting and decorating shop in nearby Urmston. "As a kid, I can remember begging and pleading with them to let me have a pony," she says. "When I was 11-years-old I managed to persuade my mother to let me have riding lessons. She agreed. But it was on condition I didn't tell my father..."